Our women's diabetic sandals help diabetes patients protect their feet from complications like strain, ulcers, numbness calluses, etc. They are also highly effective for patients with diabetic naturopathy in their feet. These womens diabetic sandals have been designed for ultimate level of comfort and are extremely light-weight. This ensures that the diabetics do not feel any pressure under their feet. These footwear provide plenty of room for toes as well allow air to circulate freely. DIS womens diabetic sandals have no heels or pointed toes further reducing the pressure on the foot. Available for sizes starting from 6 to 11. 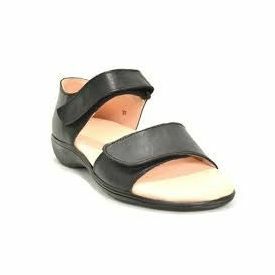 Details Upper : 100% Genuine LeatherSole : PUInner Sole : MCP / MCROur women's diabetic sandals help diabetes patients protect their feet from complications like strain, ulcers, numbness calluses, etc. They are also highly effective for patients with diabetic naturopathy in their feet. These womens diabetic sandals have been designed for ultimate level of comfort and are extremely light-weight. This ensures that the diabetics do not feel any pressure under their feet. These footwear provide plenty of room for toes as well allow air to circulate freely. DIS womens diabetic sandals have no heels or pointed toes further reducing the pressure on the foot. Available for sizes starting from 6 to 11.